I have a vivid imagination, but I swear I didn't make this up. Yesterday while visiting Charles' farm, I saw farm manager Angie walk across Broadstone Rd. with an old feed bucket. "Hey, do you mind if I follow you around and take photos of whatever you are gonna do?" I asked her. She hesitated at first, and then gave a little giggle. 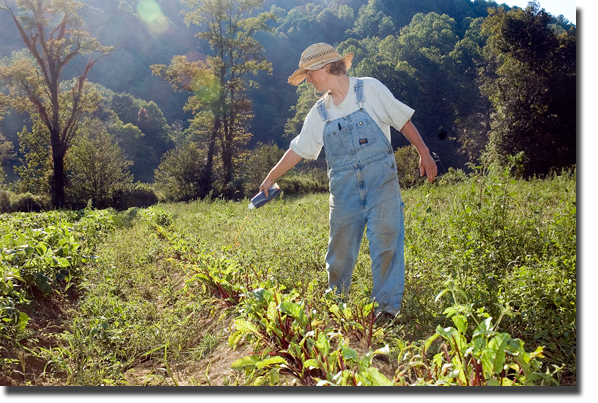 "Um well, I was getting ready to spread a little bit of coyote urine on the beets," she said. I laughed. It was a sentence I never thought I'd hear. "Where do you buy coyote urine?" I asked. "No telling. Charles just told me to use it and I've been putting it off. I've never done this before," she admitted. I'm a dimwit, so naturally I followed her into the field. As we approached a row of beets she showed me damage caused by foraging deer. "We were going to sell the greens with the root," she said as she fingered the leafless stems. Angie bent down and opened the feed bucket. Inside were two containers, a ketchup-sized squeeze bottle filled with a thick brown liquid and a larger one with the same stuff in it. "Well, are you going to smell it?" "I reckon I should just to make sure it is coyote urine," she said as if she would know the difference between that and cow piss. She raised the bottle to her nose and took a big whiff. Then she gagged and almost vomited. When she finally caught her breath all she could say is, "That is nasty. Oh that is really bad." I took the bottle from her and smelled it from a distance. And yes, it smelled like old rotten pee. Angie bravely took back the bottle and got back to business at hand while I followed her down the row, photographing the process. We laughed the whole time at the absurdity of what we were doing. A puff of a breeze came up and the stench permeated our noses. Like school girls running away from sweaty boys, we dropped what we were doing and giggled as we ran upwind to escape the stench. "I'm glad you were here to experience this with me," Angie said. "Yeah, I feel like we've gone through something special together," I said. Where does one acquire coyote urine? The internet, of course. And look, coyote urine is a pasteurized biopesticide. I did not know that.